Hasan Lufti Shushud (b. June 8, 1901, d. January 1, 1988) was a saint and Master of Wisdom who lived throughout his life in relative obscurity in and around Istanbul, Turkey. He did not speak of his personal history. We do know that he studied in private schools and began his professional life as a teacher of French and English, but spent the majority of his working life at a series of banks. As for his family life, he was married and had three children, two boys and a girl. 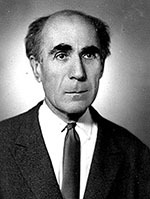 His spiritual life began in 1917 and intensified soon after when he discovered the impact of fasting, zikr (a type of breathing exercise), and suffering, the principal practices in “Itlak, the Path of Annihilation.” He came to understand that direct experience, which can be achieved by these practices, is the only way to complete liberation from our material reality. Itlak Yolu is outside of Islamic Sufism and has affinities with Buddhism and the Shamanism of Central Asia from the time of Ghengis Khan. Hasan Shushud has two books, both translated into English. His book of aphorisms is entitled Fakir Sozleri (translated literally: Poor Glossary). His other book, Hȃcegȃn Hȃnedȃni (Masters of Wisdom of Central Asia), covers the biographies of the Naqshband Order of Sufism who lived in the fourteenth century. (It should be noted that some Sufis of the Naqshband Order of Sufism may represent some of the characteristics of the Masters of Wisdom and that the period of the Masters of Wisdom started in the twelfth century.) More important than the biographies are the book’s introduction, appendix and glossary: They present unique concepts that deserve the utmost attention. Especially towards the end of his life, Shushud shared the Itlak practice with all those serious aspirants regardless of their religious background. His Masters of Wisdom sent me on a long pilgrimage across Turkey and Uzbekistan in 1988. The memories and experiences became infused into my soul. I am currently living in Turkey. I have been deepky touched by both Nevits and Shushuds teachings. I am greatly interested in learning more about the path with someone in person. Is there anyone in Turkey(i am in Istanbul) who is still holds the lineage of Itlak Yolu? I will ask a woman who is in Istanbul periodically. She certainly knows about fasting. That said, would you like to Skype? Is there someone you can ask in British Columbia who knows about breathing? Thank you. Or would it be possible to meet you sometime to see how you were taught? Meeting with you would be my pleasure. I will email you with more information. Is there anyone you know in Southeast Asia who practise Itlaq Yolu? I am unaware of anyone in Southeast Asia who practices Itlaq Yolu. If you would like to Skype, just let me know. Thanks for the reply, I got the book “Masters of Wisdom of Central Asia” a while back. Im interested in the breathing…somebody learnt it in Switzerland/Europe? I’m afraid I don’t know anyone in Switzerland/Europe who knows the breathing. (And certainly, there might be!). I speak only English. If your English is strong enough, we can Skype. You are always welcome to email me.